Setting your T-zone up for makeup success starts before you even put on the first drop of foundation. Once you’ve finished your skincare routine, prep your T-zone with a mattifying primer that absorbs oil. This will help control oil throughout the day and minimise the appearance of pores, which can be especially prominent in the T-zone. For foundation, choose a formula that’s best for the majority of your face (if most of your face is dry, choose a moisturising formula). Apply it everywhere except your T-zone, blending away from the T-zone, not toward it. 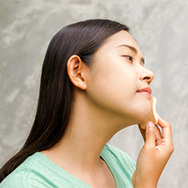 Buying two different foundations for your face can be expensive, so a concealer for oily skin can save the day. Choose a matte-finish, medium-coverage concealer that’s as close to the colour of your foundation as possible, then apply it to your T-zone, blending it in to the foundation you’ve already applied for a seamless look.